An American Witness to India's Partition. By Phillips Talbot. 440 pages. SAGE Publications, New Delhi (October 2007). In 1938, the Institute of Current World Affairs in New York appointed a 23-year-old scholar, Phillips Talbot, to observe and report on the dynamics of contemporary India. Destiny ensured that he would be an eyewitness to South Asia's most uncertain and critical decade in which everything hung by the slenderest of threads. Traveling widely and consulting with both political stalwarts and ordinary people, Talbot recounted the fast-paced situation in regular letters to his sponsor. 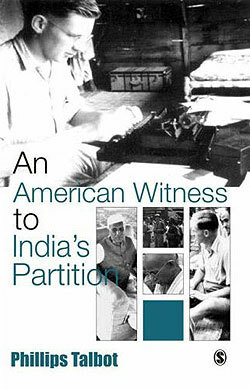 Now published as a book, An American Witness to India's Partition, they open an original American vista to the dramatically formative years that brought empires crashing down and lit fratricidal fires of hatred. An early missive to New York even before Talbot set foot in India assessed disaffection of Muslims and divisions between princely India and British India as the two political weaknesses of the Congress Party. On the issue of future economic planning, he wondered where the funds for the Congress' ambitious developmental schemes would come from. In December 1939, Talbot interviewed Jawaharlal Nehru in Aligarh and extracted memorable quotes like "America and Asia, rather than Europe, are the continents of the future." The future prime minister was keen to emphasize that "the democratic sentiment of the United States is with us [nationalists]" (p.55). In March 1940, Talbot watched Mahatma Gandhi dazzle an audience of 5,000 people with "super-rational crowd control" that made it appear as if he was speaking directly to each and every listener. His "strong personal power" in Indian politics owed to this special trait of human emoting. Blessed with the knack of resting his body completely while the mind carried on, the Mahatma was "the most efficient worker in India" (p.150). No laggard in sharp wit, he adverted to his Sevagram ashram as "my lunatic asylum" of which "I'm the biggest nut of all" (p.149). Talbot talked to Muhammad Ali Jinnah of the Muslim League, who alleged that "Gandhi was subordinating everything else to the establishment of Hindu rule" (p.63). Harsh language from this self-described "cold-blooded logician" presaged the League's official launch of the cry for a separate Pakistan in April 1940. A "tea-time chat" with Jinnah's subordinate Liaqat Ali Khan unveiled his profound loyalty to the British on the grounds that the colonial rulers, unlike Hindus, "do not interfere with my culture and religion" (p.59). Contrasting the atomization of India's joint families and its revolutionary attitudinal consequences with "the masses still clinging to the old standards," Talbot pondered how this would affect India's social stability and prospects for democracy. He visualized that "the India I am seeing in the villages and towns represents the end of an era, and the coming generation will see terrific and perhaps violent changes" (p.91). The increased frequency of industrial strikes was a sign "that the time of organized labor is coming here as it has come in the West" (p.147). While feting bright, educated, and cultured Indians, the author raised the complex question, "How could such a shining community permit the continuance of beastly conditions under which the poor live?" (p.93). Such a poser begs for an answer with equal relevance today in the 21st century. In 1941, Talbot investigated religious riot-torn Bombay and found "no indication of any material cause." Rather, the disturbances were "surface evidence of the bitter feelings being aroused by passionate inter-communal strife that now dominates Indian politics" (p.145). Fanned by the League's propaganda since 1937, communal consciousness "spread widely through the Muslim population" and this, in turn, "inspired the rise of a virulent Hindu Mahasabha" (p.166). Besides the material despoilment, Talbot noted the "spiritual damage" and loss of soul in India's community life caused by religious bigotry. The only silver lining amid the waves of violence that hit Calcutta in 1946 was Muslim families sheltering Hindu neighbors from rampaging mobs and vice-versa. On the trail of Gandhi's astonishing efforts to contain the communal frenzy in eastern Bengal, Talbot marveled at "a little old man who has renounced personal possessions, walking with bare feet on the cold earth in search of a great human ideal" (p.205). Lost in an unreachable corner of the country at a time when India's national destiny was being decided by the Congress, the League, and the British in the capital city, the Mahatma was "testing his non-violence and seeking a solution at the familiar village level" (p.207). He took interfaith tolerance and prevention of forcible conversions of Hindus in remote hamlets as seriously as negotiations for the transfer of power in Delhi. On the eve of independence in 1947, Talbot met Congress strongman Sardar Patel, a model of self-confidence about the party's ability to weather internal feuds. Though the princely states were threatening to spoil after the departure of the British, Patel was nonchalant that "they will fall in line" (p.246). His authority in national politics derived from invincibility in his native province of Gujarat where "nothing could happen without his knowing it" (p.271). Talbot was a privileged spectator of Patel's dispute resolution acumen at Bardoli, when he ruled against his own peasant proprietor supporters for exploiting aboriginal agricultural laborers. On the scourge of communal riots, Patel had in mind a characteristic panacea: "We need authority to control it" (p.312). As early as March 1947, Talbot heard Indians regarding themselves "natural leaders of Asia" by virtue of their pioneering efforts at decolonization. Jealousy and competition with China, which also had continental ambitions, could be foreseen. At the Asian Relations Conference in Delhi, Talbot marked that the "Chinese delegation was not eager to encourage Indians' bid for leadership" (p.276). One of its members commented that the event was engineered to be a "good platform for Nehru" (p.281). Meanwhile, "mullah-ism" and extremist Islamist jihadist influences were already being manifested in the League's drive for a separate state of Pakistan. The partition of India was, to Talbot, "a prime example of the supremacy of passions and psychological factors over solid self-interest" (p.297). The advantages of retaining economic balance and unity in Bengal and Punjab were innumerable, but it was not to be. Truncated India risked mass starvation after losing the wheat granaries of western Punjab. Pakistan suffered crippling capital flight with the exodus of Hindus who had dominated banking, insurance, and finance sectors. Independence came at a very heavy price, uprooting 12 million people and killing nearly 1 million. Referring to the nation's troubles to Talbot, Gandhi used the analogy of hydrophobia: "Cures have been known, but they are very difficult" (p.341). By December 1947, Talbot gathered that bitter popular feelings spread in both India and Pakistan over Kashmir. Strategic considerations raised the stakes as "Kashmir faces Russia and neither Dominion wants to abrogate its interests there" (p.353). Arguments that India aimed to reabsorb Pakistan animated Pakistani cabinet meetings and chatter in refugee settlements. Any compromise on bilateral economic conflicts was disallowed by collective conviction in Pakistan that it would invite "future Indian encroachment" (p.366). It was clear to Talbot, writing in 1950, that "hatred of India is the cement that holds Pakistan together" (p.368). Confronting restlessness in Pakistan's northwest, officials confided in the author that "it will be easier to let the tribes go again into Kashmir than to hold them in leash" (p.373). Pakistan considered it beneficial to "beat the drum of resumption of war," since "the more frightened other nations became, the more likely they are to apply pressure for an early solution of the Kashmir problem" (p.388). Talbot's final letter describes the onset of disillusionment in India during its third year of freedom. Declining agricultural productivity, bureaucratic restrictions on businesses, labor militancy, and a general loss of "purpose and high destiny in national energies" were visible. India's aspirations to lead Asia were slipping as, "in its present straitened circumstances, it does not find it easy to give material aid to anyone" (p.406). In due course, China would steal a march over India precisely through the instrument of foreign aid to fellow developing countries. Few books bring to life epochal pasts featuring all-time-great personalities. Talbot's An American Witness to India's Partition is one that does. His sharp analytical skills grasped trends that bamboozled many contemporaries. Looking back through his lenses, one reflects on the remarkable continuities in patterns between then and now. The modern history of the Indian subcontinent changes for sure but in ways that do not displace its eternities. View the Worldpress Desk’s profile for Sreeram Chaulia.